Yo Radio (“Yo Radio”) understands that it is a privilege to have you as a customer and is committed to protecting your Personal Information and safeguarding your privacy over the Internet. 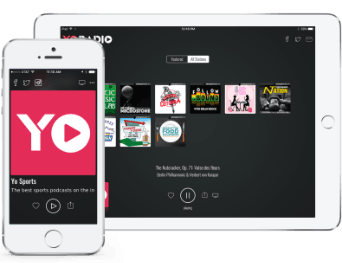 The “Yo Radio Products and Services” is defined as YoRadio.com, associated mobile applications, software, and Internet services under our control, whether partial or otherwise, in connection with providing a platform for Yo Radio's services. Personal Information. We collect Personal Information when you create an account to use the Yo Radio Products and Services, such as your name, email address, username, password, and billing and credit card information. You may also register by using your Facebook log-in credentials. When you log in with your Facebook credentials, we collect the Personal Information you have made publicly available in Facebook, such as your name and profile picture and use that information to register with Yo Radio. We may also obtain other information with your permission, such as your gender and date of birth. You control what information is shared from your Facebook profile by adjusting your Facebook privacy settings. We may collect Personal Information when you subscribe to the Yo Radio newsletter, participate in forum discussions, or when you enter events, such as sweepstakes or contests. The Yo Radio Products and Services may collect and store your location information if you enable your computer or mobile device to send it to us. Changing the settings on your computer or mobile device may prevent this data collection. Non-Personal Information. We may collect Non-Personal Information when you create an account, such as year of birth, gender, and postal code. We also collect demographic information, such as your country, in several other ways. We also collect anonymous statistical user and browser information through the Yo Radio Products and Services users, including: (1) the Internet Protocol (IP) address of the user's computer, (2) the websites from which people visit the Yo Radio Products and Services, if any, and/or (3) the brand and version of the user's browser software. We collect the information you enter into the Yo Radio Products and Services. When you use Yo Radio Products and Services, we and our third-party service providers also receive and record information on our server logs from your browser, including your IP address, and from cookies, web beacons, and similar technology. Cookies are small text files that we place in visitors' computer browsers to store their preferences. Most browsers allow you to block and delete cookies. However, if you block our cookies, the Yo Radio Products and Services may not work properly. Direct Marketing. We do not rent, sell, or share Personal Information about you with other people or nonaffiliated companies for direct marketing purposes. We may allow access to other data collected by the Yo Radio Products and Services to enable the delivery of direct marketing and offers that will be of greatest utility, relevance, value, and interest to you. If you would like more information about this practice and to know your choices about not having this information used by these companies, click here. Critical technical-service issues relating to the Yo Radio Products and Services. Content Providers. Yo Radio may be required to provide specific access and usage information to content providers and rights holders as a condition of content licensing and royalty agreements. In such cases, Yo Radio may provide content access and usage, user demographic, and other information that does not include your Personal Information to the content provider. Social Networking and Other Websites. When you use the Yo Radio Products and Services, you may share Personal Information with social networking websites, such as Facebook. We do not share information with them unless you direct the Yo Radio Products and Services to share it. Their use of the information will be governed by their privacy policies, and you may be able to modify your privacy settings on their websites. Anonymous Statistics. We may share anonymous Yo Radio Products and Services usage information for the purpose of measuring the effectiveness of affiliate programs. None of such information shared is Personal Information. Vendors and Suppliers. The Yo Radio Products and Services use Personal Information for internal and service-related purposes only and may provide it to third parties to allow Yo Radio to offer the Yo Radio Products and Services, including credit card processing. Yo Radio vendors and suppliers are bound by strict contractual requirements to keep all Personal Information they receive strictly confidential and to use and process such information solely on behalf of Yo Radio. Although we do take (and require our third-party providers to take) security precautions regarding your Personal Information, due to the open nature of the Internet, we cannot guarantee that any of your Personal Information stored on our servers, or transmitted to or from a user, will be free from unauthorized access. We disclaim any liability for any theft or loss of, unauthorized access or damage to, or interception of any data or communications. By using the Yo Radio Products and Services, you acknowledge that you understand and agree to assume these risks. To access your account information and preferences, select Manage Account from a link or menus on either the Internet at www.yoradio.com or the Yo Radio software. When you access your account, you can update your account information to make it accurate. You can also manage your preferences for receiving newsletters and promotional emails. If you have forgotten your username or password, you can use our online support resources here: Yo Radio Support. You also consent to the adjudication of any disputes arising in connection with us or the Yo Radio Products and Services in accordance with the Terms of Service. 103 W. Vandalia, Suite #100, Edwardsville, IL, 62025, (618) 659-1552 (phone) (618) 659-2203 (fax).